Philip Pullman has - surprisingly - announced that he has written a sequel trilogy to His Dark Materials, and the first book will be published on 19 October this year. Philip Pullman published his critically-acclaimed His Dark Materials fantasy trilogy (Northern Lights, The Subtle Knife and The Amber Spyglass) for young readers between 1995 and 2000. Regarded as darker and more challenging than the contemporary Harry Potter series, the trilogy has sold over 22 million copies and spawned an unsuccessful movie adaptation, The Golden Compass, in 2007. Since completing the trilogy he has published two further stand-alone novels, The Scarecrow and His Servant (2004) and The Good Man Jesus and the Scoundrel Christ (2010). Over a decade ago Pullman started working on a Dark Materials companion volume, called The Book of Dust. He made it clear this was not going to be a fully-fledged sequel, but a companion book expanding on some of the worldbuilding elements in the original trilogy (most notably, the nature of the substance "dust"). Pullman has occasionally mentioned it in interviews as something he was tinkering with, not giving any impression it was a major project. That, it turns out, was a bit of an understatement. The book has ballooned into a fully-sized sequel trilogy, The Book of Dust, which will take place in two different time periods. It will incorporate elements from Lyra Belacqua's childhood as a prequel to the main trilogy, but it will also explore the life and times of a grown-up Lyra some thirty years later. Pullman confirms that other Dark Materials characters will also appear, making this simultaneously a prequel and sequel to the original trilogy. David Fickling Books will released Book 1 - still to have its title confirmed - in October. It's unclear if Pullman has completed the entire trilogy (you'd hope so, given the length of time it's taken), but the publishers have said it won't take seventeen years for the next volume to arrive. Excellent news. Although His Dark Materials lost its way towards the end (when people in gyrocopters started shooting down angels with miniguns), the trilogy was weird, offbeat and challenging. Here's hoping the pre-sequel is in a similar vein. And has more armoured polar bears! Meanwhile, the BBC and New Line Studios have teamed up to produce a new TV series based on His Dark Materials. The series is expected to unfold over four eight-episode seasons. Casting is currently underway with production due to start in Wales in the next few months for a likely 2018 debut. 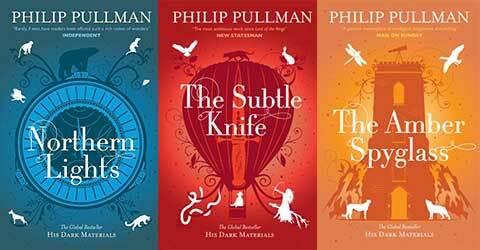 Did you like the His Dark Materials series? I really liked the first two. The third one I didn't think quite worked. Will have to do a reread. I think I read the trilogy originally in 2002 or 2003. That's cool! I've been checking for an update on this one every now and then. From what Pullman said about the Book of Dust I actually had the impression that it was something major but I didn't expect a multi-volume set, of course. I'm also wondering about the accuracy of this being a trilogy. I'm not questioning you, Adam, but rather the Guardian's account. When I looked up Pullman's own website to see if there's additional info I saw his entry on the very subject. The Guardian quotes some of this ad verbatim which makes me wonder how much input they had from Pullman himself, if any. Thing is that Pullman never talks of a trilogy or three parts. In one spot he talks what "[t]his volume and the next" will cover; I'm not sure if this is the whole projected story (which would make it a two-parter) or if the story continues in further volumes beyond the topic Pullman talks about (which would open the door for more than three volumes). The Guardian also cites the publisher so they apparently do have additional sources. I'm not saying that The Guardian is not to be trusted, mind you, but I wonder whether the author of the article simply assumes this to be a trilogy (possibly because trilogies may seem to be the standard format for people who are only superficially acquainted with the fantasy genre). Do you have more specific info regarding this, Adam? "Although His Dark Materials lost its way towards the end"
I can't believe this wonderful, fantastic news! I went back to His Dark Materials about a year and a half ago, and I have to agree. Book 1: classic. Book 2: entertaining continuation. Book 3: kind of a mess (although not terrible).